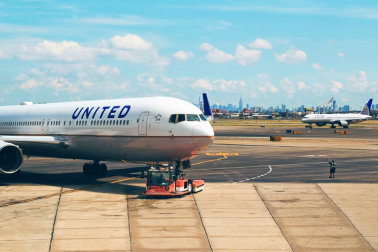 Airlines for America (A4A), a trade organization representing major U.S. airlines, required a platform to provide real-time operational airline data to media outlets and air carriers. 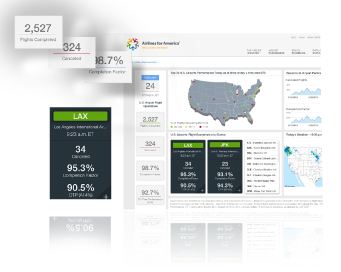 Furthermore, A4A needed to track key performance indicators such as completion rate, cancellations and on-time performance for more than 23,000 flights on a daily basis. The amount of data available was quite large and highly technical. Retrieving the data required tapping into the flight tracking software for every single airline included in the data set; which meant that Joonik had to create multiple interfaces to enable the system to read different and complex data formats. The data had to be pulled, compiled, and analyzed in real-time. In addition, the intended audience had varying degrees of expertise so the data needed to be presented in a way that conveyed the overall picture while still allowing for in-depth review. Joonik gathered flight data sources and created a platform for analysis and internal testing. 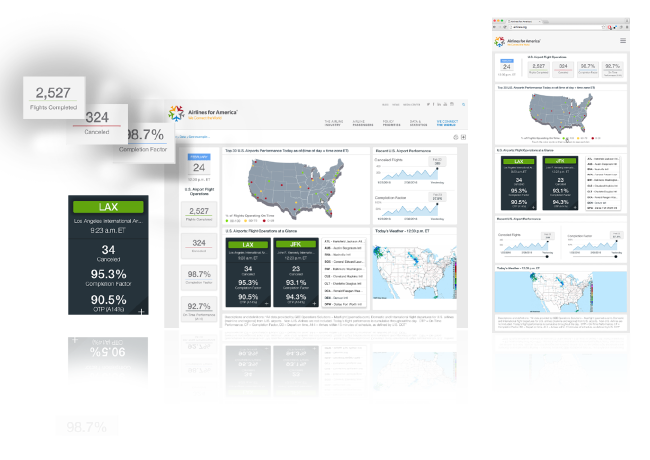 We researched air transportation industry reports and the latest dashboards to understand users’ interests and requirements. 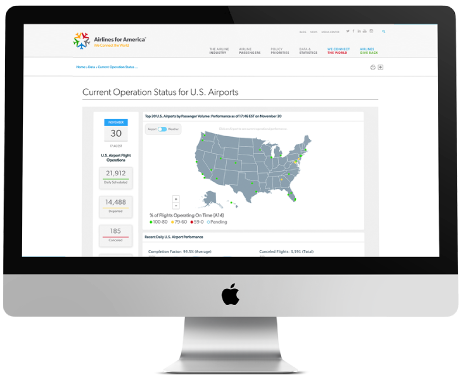 Real-time data was summarized for the top 30 U.S. airports and weather conditions were added to show a complete and comprehensive view of each airport’s operational metrics. Furthermore, the main view displayed flight operations throughout the entire country; portraying key metrics and performance indicators. Joonik created an interactive graphical dashboard providing real-time metrics and data analysis tools. There are no tables and the site’s components allow users to explore details and perform mining activities. In this truly dynamic web app, the information is summarized by location and can be cross-referenced with real-time weather conditions. This platform was broadcasted through various press releases in 2016, and today is an integral part of A4A’s website and one of its most valuable big data analysis tools. 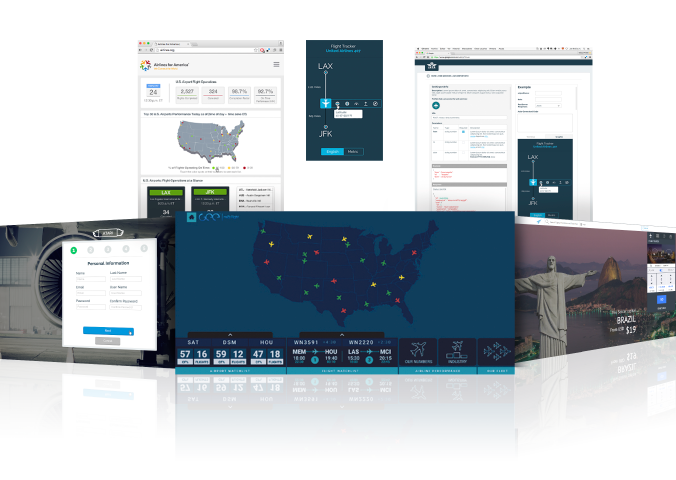 Real-time data was summarized for the top 30 U.S. airports and weather conditions were added to show a complete and comprehensive view of each airport’s operational metrics. Furthermore, the main view displayed flight operations throughout the entire country; portraying key metrics and performance indicators.